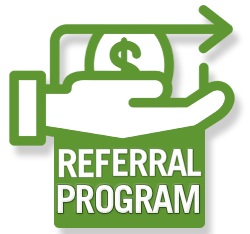 Ask about our referral program today! We appreicate you and your referral and want to show you what you mean to us! We have a number of ways to make sure you get credit. - But ask your referree to mention YOU when they order! - Once the job is complete and paid in full, we'll email you to arrange your referral reward. Look out for an email from iDeal Floors subject line "iDeal Rewards"
- Follow the link in the email and fill out your request form. - Sit back and relax. Your reward will be on its way. - A Check mailed directly to you. - Store Credit at iDeal Floors. Get more awesome products to complete your project. - Donate your reward to a non profit of your choice.